Every Allegheny County Family Division case is assigned to a particular Judge. Each Judge has a "judicial suffix". This is a 3 number suffix attached to the end of your "FD" number and will be from 001 to 016. If your judicial suffix is "008", then your case has been assigned to Judge Cathleen Cawood Bubash. Judge Bubash's chambers (i.e. offices) are at Room 5036 (5th floor) of the Family Division Building. The Chambers phone number is 412-350-5798. But do NOT simply call or walk into her offices. If you have a question about her procedures, click here and then click on her name. This 13 page guide should answer most questions. But it is always best to hire counsel that is familiar with the Judge, her preferences and viewpoints. There is an old saying: "good lawyers know the law, great lawyers know the Judge". 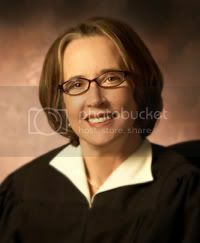 Judge Bubash was born in 1959. She is a graduate of Churchill High School (1977), attended Penn State for her BA degree (1981) and then obtained her law degree from Duquesne University in 1985. While at Duquense in 1984, she was one of 25 law students chosen nationwide to intern at the NAACP Legal Defense and Education Fund. Judge Bubash was admitted to the bar in 1986. Judge Bubash worked as a Public Defender from 1989 to 1995. From 1989 -2000, she worked as a private attorney focusing on Criminal Law. She has served as an adjunct professor at CCAC (1999-2004), American Intercontinental University Online (2000-2007) and more recently California University of Pennsylvania. After working as a criminal defense attorney, she served as a Magisterial Justice (District Judge) on the North Side from 2000-2007. While a District Justice, she dismissed simple assault charges stemming from a fight that were lodged against Steeler Deshea Townsend, after 4 of 6 witnesses said that he was not involved and the other two could not remember. Judge Bubash was appointed and then elected as a Court of Common Pleas Judge in 2007. She was assigned to the Family Division upon taking the bench in 2007 and is still at Family Division. Common Pleas Judges are elected to 10-year terms. Judge Bubash has been involved in various neighborhood groups on the North Side, including the North Side Community Development Fund. She has two children, Isabella and Georgia. To see a very short video of the Judge, click here.